Organized by CPT code section and number, just like the CPT code book! Indispensable guide provides the official AMA interpretations and rationales for every new, revised and deleted CPT code for 2019 and guideline change. A must-have resource for 2019 CPT® coding. Completely redesigned! 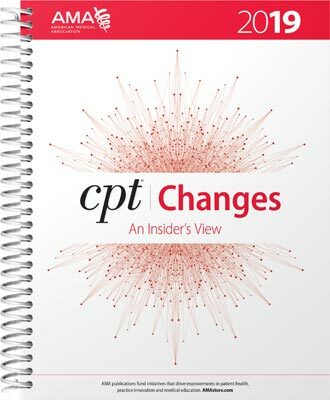 For a better understanding of the CPT® code set, rely on the best-selling CPT® Changes 2019: An Insider's View. Find the meaning behind all of the changes noted by the symbols you've come to know within the AMA's CPT® Professional Editioncode book. Invest in this annual publication and get the insider's perspective into the CPT code set right from the source—the American Medical Association. AMA is the authority to turn to when seeking an official interpretation and explanation for a CPT® code or guideline change. Know the changes inside and out. Avoid and reduce claim denials.